Fit your body contour the 100% Natural Way with the new Bliss Supreme 3 layer natural latex organic mattress. Made in America with local organic ingredients! This mattress is built with three layers of 100% natural latex from the Brazilian rubber tree. 2 inches of soft latex on top and bottom surround a solid core of natural latex. Among the oldest materials used by man, latex also creates an ideal sleeping surface because it naturally adjusts to the subtle differences of every body contour. This helps to reduce pressure areas and prevent restricted capillary blood flow, which can cause muscle aches, tossing and turning, and other sleep-related discomforts. The 100% natural latex in The Bliss Supreme has thousands of vent holes to keep you cool in the summer and warm in the winter. And with no chemicals and no pesticides you’ll have no sleepless nights. The mattress is surrounded in Organic PureGrow Wool fleece and covered with a soft organic cotton cover. This makes it completely free of synthetics, bleaches, dyes, fire-retardants or silicate barriers that may be found in other "organic" mattresses and memory foam mattresses. Our 100% Natural Latex does not contain synthetic or petroleum-based foams found in other latex mattresses. The body of the mattress starts with 6" of firm latex, giving perfect support. Then a plush 2” layer is added to the top and bottom for exquisite comfort. Organic cotton and PureGrow Wool quilting is wrapped all around the mattress for added comfort and a more cushy feel. (See our section on "The benefits of wool" in the Learn section of our site). Then its put into a soft outer organic cotton cover! • 100% natural latex - no synthetics, no petro-foams! • 100% Organic Cotton grown in California! 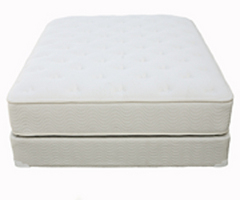 • 11" mattress height - 6" layer of medium firm latex for support and two 2" layers of plush latex for added comfort, 1" of PureGrow wool and organic cotton quilting to an outer organic cotton cover. • PureGrow Wool is naturally flame retardant so there is no need for chemical flame retardants such as formaldehyde or PDBE, a known carcinogen, used in most commercial mattresses. • Our wool is locally and organically farmed in Sonoma County, Northern California from free and "happy" sheep. 11'' high mattress - Sizes: Twin (38x75”), Twin-X Long (38x79”), Full (53x75”), Queen (60x79”), Dual-King (76x79”), and CA King (72x83”). No boxspring or foundation is necessary if you already have a slat bedframe. The mattress can go right on the slats as long as the slats are no more than 3" apart. With most bedframes you can remove the slats to use our amazing Prodigy Adjustable base System. Check it out out here. If you have a boxspring bedframe or metal bedframe you'll need to use either our Wood Foundation or try our amazing Prodigy Adjustable system with this mattress. Find out more about these systems on the previous page. Our latex (natural foam derived from the hevea brasiliensis rubber tree) innately adjusts to the contours of your body, providing gentle orthopedic support for proper spinal alignment. In addition, latex foam reduces pressure areas and helps prevent restricted capillary blood flow, which can cause muscle aches, tossing and turning, and other sleep-related discomforts. The natural foam latex contains no toxic substances, and emits neither fumes nor ozone-depleting gases. It is naturally mold and mildew resistant, and provides a most unfavorable environment for pesky dust mites. All in all, due to its hypoallergenic nature, latex is the perfect mattress material for allergy sufferers. This is an Earthsake Mattress. You wont find the Earthsake Bliss Supreme mattress anywhere else - so accept no imitations. It says Earthsake on the outside so you know you can trust whats on the inside! Our label only goes on the best local, organic ingredients harvested and transformed into wonderful mattresses, pads & toppers, pillows & comforters - all custom-made in the USA for Earthsake!